That's right, the entire history of liquid rocket propulsion has happened within the past 100 years. Kanstantin Tsilkovsky wrote a series of scientific papers in 1903. He described theories about rocket propulsion systems. Robert Goddard hit the scene about twenty years later (as in NASA's Goddard Space Flight Center). Goddard developed and launched the first rocket that had liquid fuel. From that point, nothing could stop humans from reaching the outer atmosphere and then space. As the decades passed, rocket technology advanced at an quick pace. At the end of World War 2, Germany had developed the V2 rocket. After the allies defeated Germany, that technology was brought to the United States. 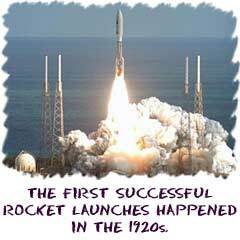 In 1949, the United States launched the first rocket that had different stages. It used a V2 for the first stage and a U.S. made rocket as the second stage. Rocket stages are sections that fire in order. Once the fuel in a stage has been used up, that section of the rocket is released. Rockets are used everywhere today. You know that the Space Shuttle uses liquid propellant in huge containers to aid liftoff. The military has unmanned rockets like the Minuteman and new smart rockets and missiles that use satellites for guidance. Even the first space launches by the U.S. placed the astronauts on top of Titan missiles. One of the most advanced rockets is the Ariane 5, developed by a French company. NASA's latest series of rockets have been named the Ares series. The Aries I will be smaller rocket designed to carry the new Orion manned capsule into space. The Ares V is a much larger rocket that will be used to carry heavy cargo loads into orbit. The Ares V will be able lift 286,000 pounds. The cargo can then be transported to the Moon or to Mars. The future of rocket technology probably lies in the use of new fuels. It requires a certain amount of effort to leave the Earth's gravity. Once the spacecraft is in orbit, new types of propulsion will be needed. Scientists are currently developing fusion engines for long-term fuel needs. Fission engines of one sort have already been used in several small spacecrafts. A new mission to Jupiter may use a fusion reactor to power the spacecraft for decades. Engineers are also developing spacecraft with huge sails to harness the power of the Sun and lasers based on Earth. No matter what fuel is used in space, we will rely on liquid fuel rockets for most of our efforts to escape the gravity of Earth.